This post follows from a previous thread The Myth of Sustainable Growth, which centred around a video/presentation by Prof Albert Bartlett on the simple maths of growth. There was some email correspondence about this as well as many comments. 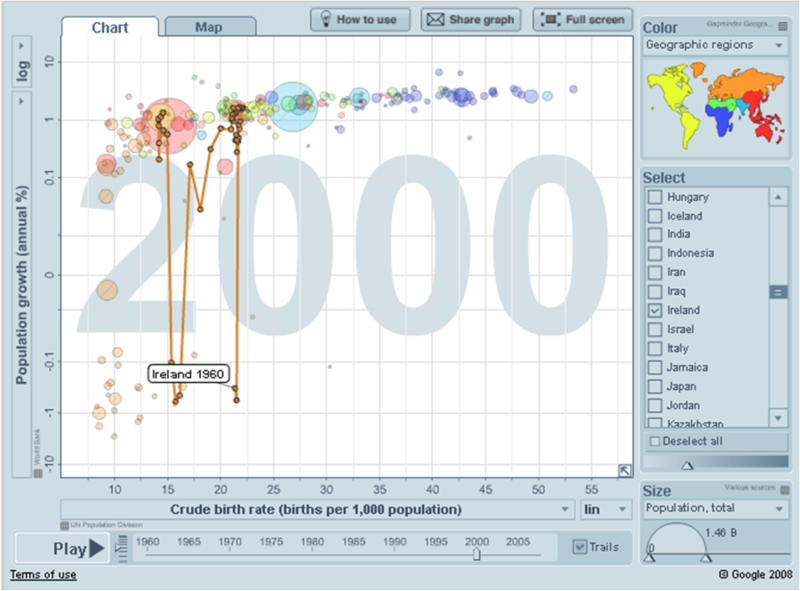 It is really just an excuse to play with Gapminder, which is curiously addictive. Basically I’m just looking at factors that influence population and need to be considered in how we would reach “a sustainable population”. Unlike ‘sustainable growth’ (which IMO is logical fallacy if by ‘sustainable’ you do really mean ‘for a very long time’) this is something that likely will happen, and without the predicted doom and gloom. Or perhaps I’m just an optimist. 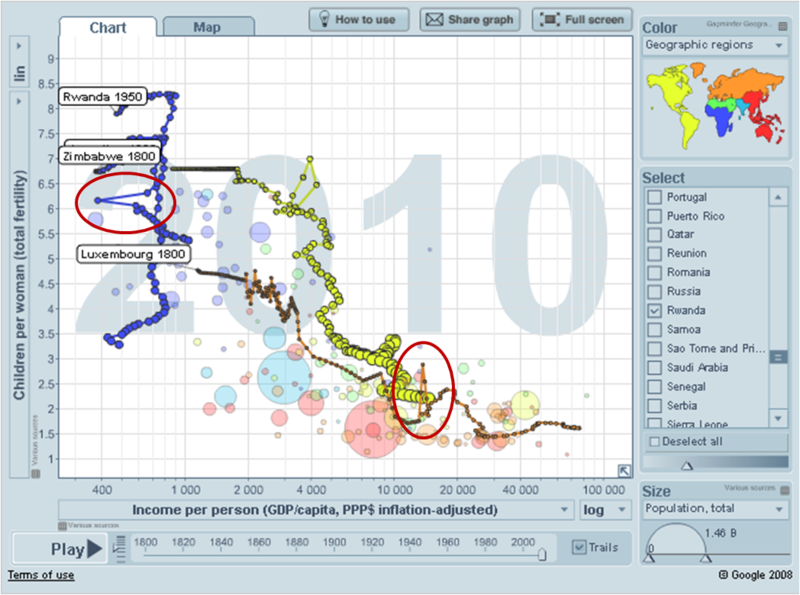 First, what is Gapminder and how does it display the information? If you click on the image below it will take you to the interactive version. By sliding the date bar at the bottom, below the x-axis, you can vary the data by date. By doing so you can see that for most countries prosperity, as measured by income per person, has increased. Population growth tends to drop as countries become more prosperous. From around 1970, several European countries drop into negative population growth – some permanently others bounce up and down. Clearly many factors are at play. Near neighbour to the UK, Ireland is one of the countries that bounces up and down and we can look at the causes, in fact we may be quite familiar with them. Population growth and birth rate in Ireland traced by year. Static image of data visualization from Gapminder World, powered by Trendalyzer from http://www.gapminder.org. The birth rate was >20 births per 1000 up to 1984 after which it fell steadily – why? In the UK we’ve grown up with stories of Irish girls travelling to the UK for abortions. Contraception was illegal in Ireland from 1935-1980, after which it was available but with strict controls that gradually relaxed. Younger generations have embraced contraception while their parents had fallen in line with the teachings of Catholicism that artificial contraception was immoral, so from 1980 we see a gradual drop in birth rate to about 14 per 1000 today. Other factors generally affecting population growth are life expectancy (health), availability of resources (food, water) and immigration or emigration rates. The 1841 census showed that there were 8,175,124 people living in the four provinces of Connacht, Leinster, Munster and Ulster. Only 40 years later, this figure had fallen by over 3 million to 5,174,836 at the 1881 census, 63% of the former value. This figure continued to fall to a recorded historical low of 4,228,553 by 1926. IN more recent times it is economic forces that are at play again. With economic boom, from 2004–2006 Ireland had one of the fastest growing populations in Europe, with annual growth rates exceeding 2%. This can be attributed to low death rates, high birth rates and immigration, notably from Eastern Europe. In fact if you visit Ireland (as we did on a family holiday this summer) you’ll find the hospitality industry awash with slavic accents. This work tends to be seasonal, as does agricultural work, but many are staying. Then there is the issue of asylum seekers, many of whom arrive pregnant (Ireland automatically grants citizenship to children born in there). Overall this creates a huge dilemma for the country. The birth rate is currently more than double the death rate, which is highly unusual among Western European countries. Overall in Ireland we see a number of social and economic factors at play in a country where food, water and major disease or health issues are no longer primary causative factors in population growth or decline. Crop failure and famine decimated Ireland’s population in the distant past, and we see the same – mass emigration – in some areas today. This is notable for example in Sudan, Ethiopia and other areas in East Africa which periodically suffer famine. However, nutrition has generally improved over the last fifty years, even in developing nations. 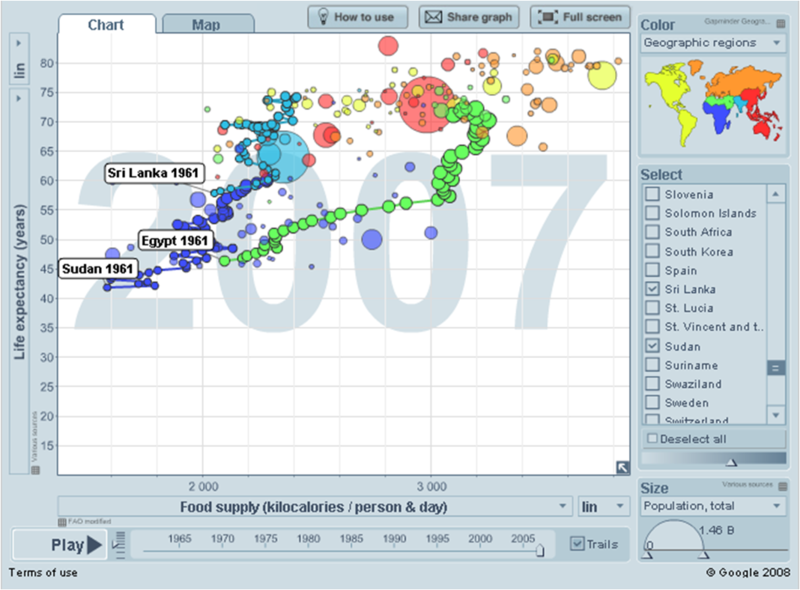 Relationship between increased food supply and life expectancy, highlighted for Sudan, Sri Lanka and Egypt in the period 1961-2007. Improved access to healthcare and clean water would also be expected to contribute to increased survival and longevity. Static image of data visualization from Gapminder World, powered by Trendalyzer from http://www.gapminder.org. If we take a look at population growth in terms of birth rate and life expectancy, the birth rate is falling and people are living longer in most places. This is true of Ireland too; the graph below however, also shows the tragedy of AIDS in Africa. 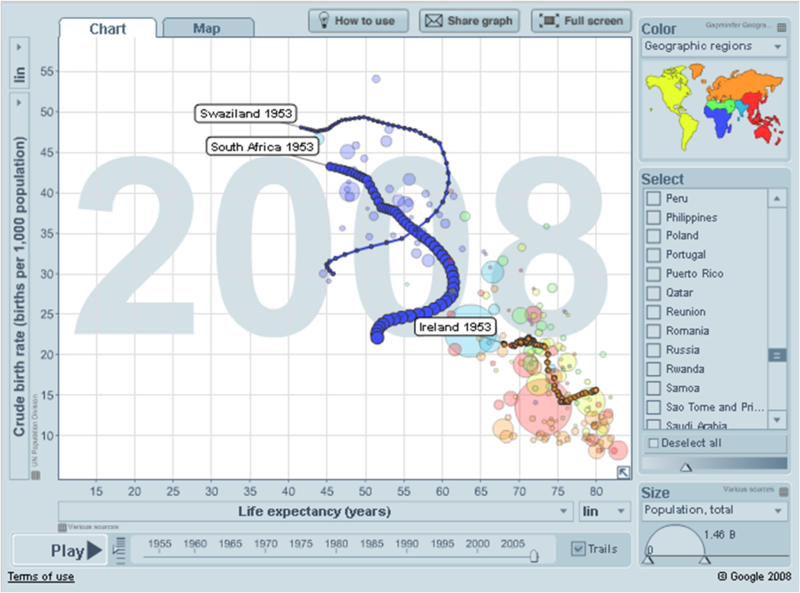 Life expectancy and Crude birth rate in Ireland, South Africa and Swaziland. 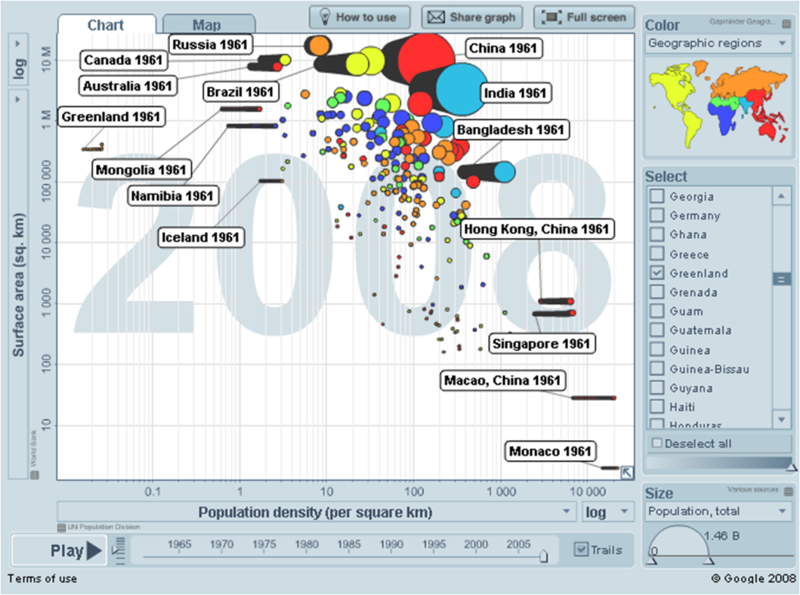 Static image of data visualization from Gapminder World, powered by Trendalyzer from http://www.gapminder.org. Taking Swaziland and South Africa as examples we certainly see a dramatic fall in birth rate; life expectancy increased from just over 40 years in the 1950s to >60 years in 1990 before falling back due to AIDS. Better health provision in South Africa may account for the less dramatic fall in South Africa. War too shows up sometimes in its effects. We can see the sudden, dramatic effects in the economy of Rwanda of the genocide in 1994. More surprising is the temporary baby boom in Luxembourg just after WWII. This isn’t apparent in neighbouring Belgium or Netherlands – anyone know the causes? Total Fertility vs GDP for Rwanda and Zimbabwe (blue), Argentina (yellow) and Luxembourg (Orange). Static image of data visualization from Gapminder World, powered by Trendalyzer from http://www.gapminder.org. Sure, 7 billion is a big number. But most serious demographers, economists and population specialists rarely use the term “overpopulation” — because there is no clear demographic definition. …if population density is the correct yardstick, then Monaco, with more than 16,000 people per square kilometer, has a far greater problem than, say, Bangladesh and its 1,000 people per square kilometer. Below we can see Monaco, Bangladesh and many others. The traces indicate the change in population density since 1961. Interestingly Russia has had both increases and decreases and Brazil, proportionally has seen a greater increase than China. Increases in population density for countries by surface area. Static image of data visualization from Gapminder World, powered by Trendalyzer from http://www.gapminder.org. 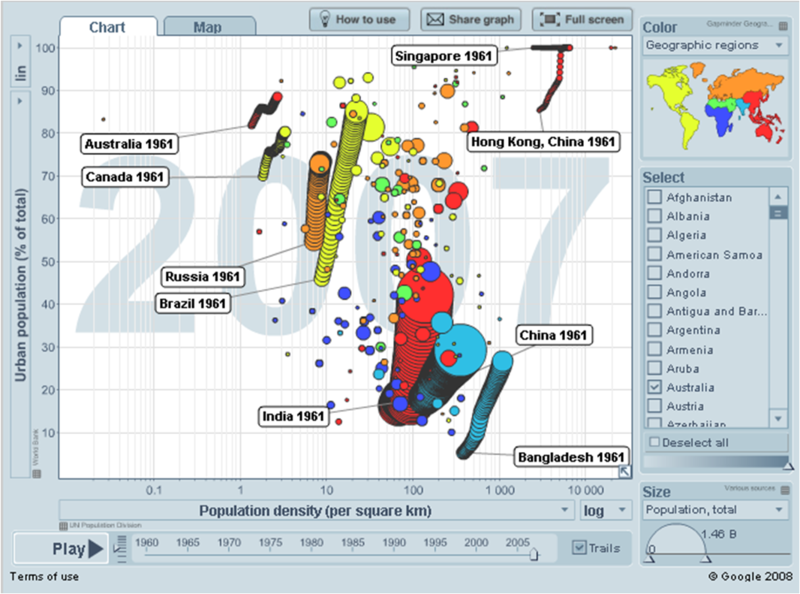 If we look at urbanisation we see how Hong Kong, Brazil and Bangladesh in particular really take off. China too. Urban population growth in relation to population density. Static image of data visualization from Gapminder World, powered by Trendalyzer from http://www.gapminder.org. But is urbanisation really something to worry about or is it just an inevitable consequence of human development? The underlying message (for the young students in the audience, as well as others watching the video clip) was that we must stop growing our world population and per capita consumption (viz. affluence, GDP, etc. ), especially in the USA. Improving efficiency, eliminating waste and real pollution all make sense (and will happen largely by themselves for economic reasons), without any draconian “top-down” measures, but I saw between the lines on Bartlett’s arithmetic a call for controls on growth to ensure sustainability. I personally think this is silly. First of all, we see that it cannot be justified based on global warming fears. Can it be justified based on fears of overpopulation and a drastic reduction in quality of life.resulting from this? Or do we live in a self-correcting world, that is driven by market forces? Isn’t the worst thing that could happen to us a drastic reduction in our affluence (or per capita GDP) some day in the future (maybe) if growth remains unbridled and exceeds our capacity to create more wealth? And the “solution” to the “problem” is to take that cut in affluence today, in order to avert it (maybe) some day in the distant future? Seems silly. Optimism favours Max’s ‘self-correcting world’. We can see in individual countries what drives population dynamics. The answer should not be to limit population but to work on the positive drivers for reducing increases. We know what those are – access to adequate food, clean water, better healthcare and reduced disease, increased prosperity and choice in family planning. We’ve achieved amazing technological feats and great understanding has given us the means to grow more food and fight disease. We are in the process of using that knowledge to help the developing world develop. It is our prosperity and humanity that drives that. Perhaps what some need is not more eco-zeal, but more patience. 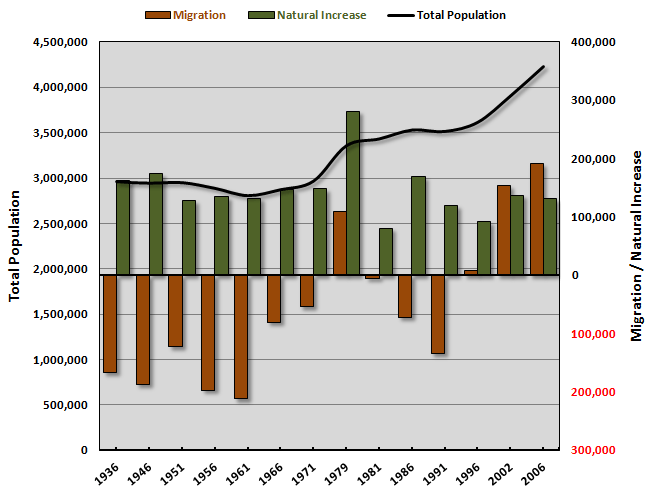 This entry was posted in Growth and tagged Population, Sustainability. Bookmark the permalink. I lived in Belfast from 1966 to 1976. Back then the population was mainly native born owing to legislation that required “work permits” for any immigrant who wanted to work for a living. I was granted a permit as an “Essential Worker” because I helped establish an enterprise that eventually employed 4,000 people. Even though I had lived in several countries, Northern Ireland impressed me beyond measure with its culture, scenery, education, road system, hospitals, sporting activities (fishing, golf, boating etc.) and much more. I decided to become a permanent resident and would be there today but for an incident that involved one of my sons and a bomb that fortunately did not detonate. I sold my business and departed soon afterwards. My eldest son attended the Royal Belfast Academical Institution (aka RBAI or Inst). This was by a large margin the best school any of my six children attended even though one of them studied at Lawrenceville in New Jersey (http://en.wikipedia.org/wiki/Lawrenceville_School), a school that is regularly listed in the “Top 20” US schools. For 30 years I maintained a connection with RBAI; it was my inspiration for creating six “Charter Schools” in North Carolina. In 2006 I returned to Belfast with the intent of enrolling my youngest son. Sadly it was not to be but that visit to Belfast shocked me by the extent of changes to my beloved city. In 1976 it was hard to find an African, Asian or European in Belfast. My favourite restaurant (Indian) closed down for lack of customers. Thirty years later it is hard to find a fast food establishment run by native born Ulster folks. While Lavery’s bar is still operating (http://www.laverysbelfast.com/) the sawdust on the floor is gone and the place is full of loud music and unwashed teenagers. Some would call that progress but I dissent. I’ll have a few re-reads, but my first impression is that I agree with Max (not for the first time), and I think you’re both right to be optimistic. I especially like your final point about more patience – we could also do with less panic [ “it’s worse than we thought!” ] and a better sense of proportion. If I look at all the fundamental processes and what has happened in most countries during the last century, I see precious little reason for pessimism. Having said that, my observation is that most people who are pessimistic tend not to need reasons for it, and they cling to it like it’s the most important thing in their lives. I look at the last 2,000 years and I’m an Optimist about the next 2,000 years. I look at the last 200 years and I’m a Pessimist about the next 200 years. In the long run, when you don’t look too close at all the little particulars that make up human history, all those little people-to-people interactions, things don’t look so bad. It’s like looking at one of these old, American movie stars selling some kind of New Super Make-Up in a TV commercial; she’s absolutely gauzy and cloudy, not a single fine detail to point to; very much like something a wiz kid with a computer came up with. Yes, indeed! The next 2,000 years look great. But behind the gauze, the clouds, when viewed without distortion or trickery, the facts of life are plain to see and the next 200 years are going to be as real and painful as the last 200 years. If not more so. Is there an advantage to China and India of have super large populations, I think so. Hummmm… population as a weapon of coercion, intimidation, power? Now that’s not new, is it? People are people, whenever you’re counting on them the most to come through with flying colors they’re probably also carrying a gun. Be careful. I have many business connections in Ireland, both North and South and many friends there. Post university I shared a house with several girlfriends who were teachers. One of our close friends was from Northern Ireland and was also a teacher, so I heard a lot about the relative merits of schools there. Apparently it was not unusual for younger children moving from N. Ireland to England to be placed in an older class based on ability due to the high standard of teaching in NI schools. There was an argument that holding them back (educationally) by putting them in their age class allowed them to deal better with the move (culturally), but often then they fell behind as there was no challenge in the lessons and they lost interest. Of course Grammar schools were retained there. Both my husband and I benefited from a grammar school education, where his younger siblings endured the change of his school to the Comprehensive system and felt their education suffered. I love the sprit in Ireland. There’s a real ‘can do’ attitude even if it is quite laid back in places still. Well it is nice to know it is appreciated. We absolutely need patience. When we wade in and dictate how things should be, often the people who need the help most do not get what they really need, or their societies change very fast to the detriment of many. Using an internal filter system, powered by the rotation of the wheels, Midomo transforms harmful water to drinkable water on-the-go. Sometimes it is wise to wear the rose-tinted glasses of optimism – if we knew what we’d have to face would we want to? What’s that saying about hoping for the best but being prepared for the worst? When I lived in Belfast (1966-1976) the young people were looking for ways to leave. They did not listen when I told them how fortunate they were to live in a country with such a fine infra-structure and rich local culture. This exodus was probably a hang over from the pressures and attitudes that slashed the Irish population from over 8 million (1842 census) to the low of 4,228,553 in 1926. When it comes to world class health care and schools I have seen nothing to match Northern Ireland. The Royal Belfast Academical Institution (aka Inst) has plenty of competition from both private and government schools. Very few cities with under one million population can boast two hospitals as fine as the City and the Victoria. Nevertheless, when it comes to industrial policy, the Republic of Ireland is the place to build a factory with its low taxation approach. Only Hong Kong, Singapore and a few ex Comecon countries can compete. Northern Ireland still has a high corporate tax rate and a reliance on “Targeted Incentives” that created a string of scandals such as the “De Lorean” debacle. So true. If we actually remembered the way it truly was we wouldn’t move an inch. Nothing succeeds like forgiving and forgetting, and we usually do. Think maybe that might be one reason there’s so many people on this planet? All that forgiving and forgetting? Maybe it’s the other way around, all that forgetting and forgiving? PS: Ref NI, think maybe the English will give it back, like Hong Kong? Someday?